Aware and Active is a participatory project for the respect of European Values and an open minded society. The project is a three year partnership of National Agencies of Erasmus+ Youth in Action that aims to promote democratic values and fundamental rights, enhance critical thinking and media literacy and support civic participation and awareness. It especially seeks to involve young people with refugee or migrant background and wishes to give them a voice. 3 training activities and Idea Labs in each participating country, that will involve over 500 young people in creating their own messages and designing awareness raising acitivies on local and national level. 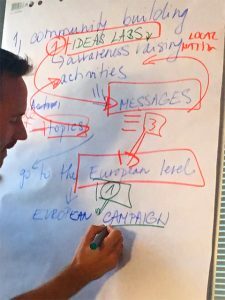 A European Idea Lab that will bring together all national messages and examples of Awareness Raising Activities and create together a European Community. A European Awareness Raising Campaign to raise the voice of the participating young people all over Europe. Online training of youth workers manual, German version.